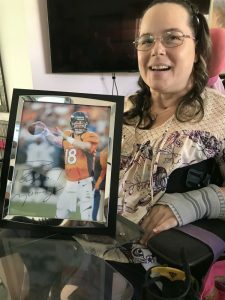 A true fan of her professional football hero, Denver Broncos Quarterback Peyton Manning, Renee Whisner proudly displays a photo of Manning which she keeps nearby always for inspiration. In fact, she is so devoted to Manning and his never-give-up, resourceful, winning attitude, Renee named her toy poodle Peyton Omaha in honor of Manning and one of his key play calls. Renee, a U.S. Air Force veteran of Desert Storm, was studying advanced yoga techniques in India when a taxi she was riding in wrecked and left her paralyzed from the chest down. 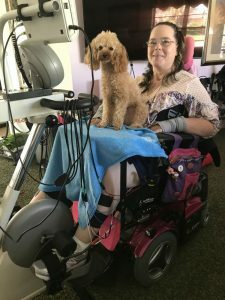 Toy Poodle Peyton Omaha is a regular on Renee’s lap during her twice-daily exercise with her MOTOmed Viva 2 from Enable Me, which is also equipped with Functional Electrical Stimulation (FES). The device sends data from Renee’s daily exercises to her caregivers at Kennedy Krieger Institute in Baltimore, MD, where therapists and physicians can monitor her progress.